1009 West Tower, PSE Center, Exchange Road, Ortigas Center Pasig City. Founded in 1945 by bosom friends, Alejandro F. de Santos, Jose B. Herrera and Artemio Delfino as an informal partnership to engage in the general practice of law, under the name De Santos, Herrera & Delfino. Subsequently, it became a duly registered professional partnership under the firm name De Santos, Balgos & Perez. With the demise of founding partner Alejandro F. de Santos in 1985, the remaining partners, Marcial O. T. Balgos and Hernando B. Perez reorganized it under the name Balgos & Perez. With the departure of Hernando B. Perez upon his becoming the President of the University of Batangas, the firm metamorphosed into Balgos, Gumaru & Jalandoni. 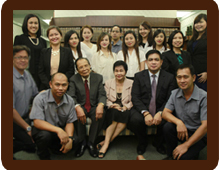 Although it has remained small, BPLaw is a full service law firm providing services to its clients in the manner as envisaged by its founding partners – without fear or favor, asking for no quarters and not giving any to protect and advance the interests of those who avail of its services. BPLaw lawyers are dedicated, loyal and fully committed to rendering effective and beneficial representation for its clients. Get to know our roster of attorneys. See the list of clientele of the Firm. See the Firm’s field of practice. © Copyright 2014. Balgos Law. All rights reserved.